Please join Northern Rockies Rising Tide for a presentation about resistance in the northwest against the Tar Sands. Four oversize loads sit waiting on trailers at Idaho’s Port of Lewiston, poised and ready to roll across the northern Rockies, save only for the final pieces of red tape. Even as executives from Exxon and Montana Department of Transportation continue to claim that the scenic routes over Lolo and Rogers passes are not being turned into a permanent trucking corridor for the oil industry, ConocoPhillips is waiting for the final go-ahead for it’s own high/wide loads to cross the region, having already been off-loaded from barges on the Snake river. Though headed for an oil refinery in Billings, MT rather than to the mines of Alberta directly, the four ConocoPhillips shipments are expected to be just as wide as the infamous loads slated to occur with Exxon/Imperial Oil’s Kearl Module Transport Project that is currently under environmental review. Most preparations for the sooner shipments have been made and there is speculation that Conoco is waiting only for some bridge construction to be completed along the route before submitting final travel plans to Idaho Transportation Department. Both ITD and regional activists plan to watch these shipments very closely. The public comment period for ExxonMobil/Imperial Oil’s Kearl Module Transport Project (KMT) environmental assessment closed on May 14, 2010. So for there has been no official response from Montana Department of Transportation, stating only that the applicant (Exxon) is still responding to the over 20,000 comments submitted. MDT received an unprecedented number of comments in the final days of the comment period, resulting in a two-day server crash at MDT and an unknown number of comments failing to be heard as a result. Theoretically, MDT could accept Exxon’s responses and issue approval for the KMT at any moment. For now, the silence is deafening. Wednesday, June 2nd saw a flood of concerned Missoulians to the Roxy theater for a screening of the critically acclaimed documentary “H2Oil” hosted by the Missoula No Shipments Network and the Indigenous Environmental Network (movie trailer available on right-hand side of this page). As the screening room filled up to capacity and more people continued to arrive, a second screen had to be opened for a simultaneous viewing to accommodate everyone. Following the film, three guests took to the stage to discuss first-hand experiences with resistance to the Tar Sands. George Poitras, former chief of the Mikisew Cree First Nation in Fort Chipewyan, Alberta spoke about that community’s experiences living downstream from the Tar Sand mines and dealing with the oil companies. Marty Cobenais, of the Indigenous Environmental Network, discussed the campaign against tar sand pipelines to the US. Surprise guest Winona LaDuke also took the stage briefly, somewhat distracting the event’s starstruck attendees from the subject at hand. Thursday, June 4th- Festivities continued in Missoula against the tar sands one day following the screening of H2Oil at the Roxy theater. A Critical Mass Bike Ride included a bike-pulled trailer carrying “Exxon’s bed” to the Missoula office of MDT. Upon arrival the bed, in which lied (sic) “Mr. Exxon and MDT Director Jim Lynch”, was stopped by a jubilant mob of anti-tar sand protesters who had assembled a mock court for the two climate criminals. After some brief arguments between the judges and the accused, Lynch was found guilty of being in bed with Exxon and sentenced to get out of bed! See the Missoulian article here. Bi-weekly meetings of the No Shipments Missoula network continue to grow in size and the trend appears set to continue. Please join us at the next meeting, June 23rd, @ 5:15pm in the back room of the Jeanette Ranking Peace Center on 2nd and S. Higgins in Missoula. We need to keep up the pressure against these shipments! Also, check out this new site created by the Rural People of Highway 12 for more information about the campaign to stop the trucks in Idaho. Thursday, June 3rd: Rally at the Montana Department of Transportation! 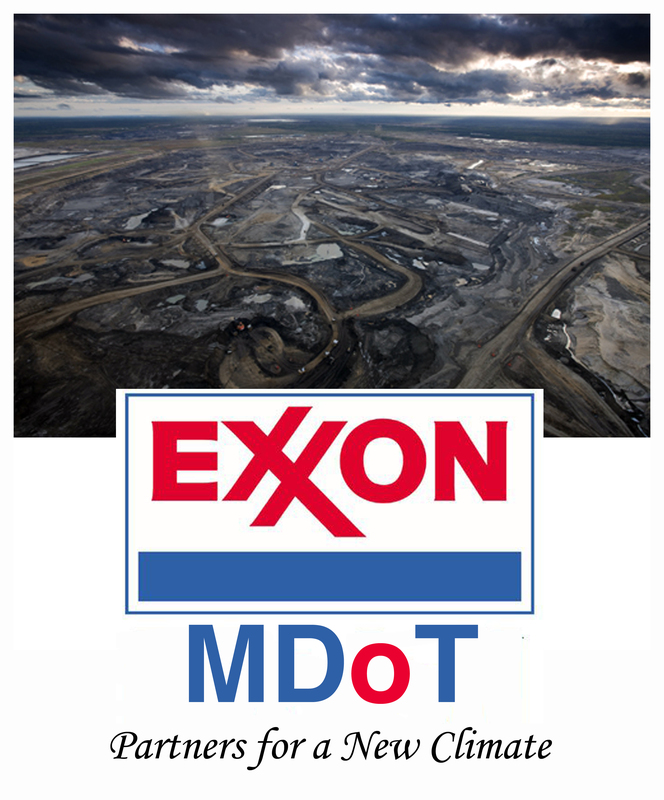 Get the MDT and Director Jim Lynch out of Bed with Exxon! This coming Wednesday, June 2nd, as many of you already know, Northern Rockies Rising Tide, the Indigenous Environmental Network the National Wildlife Federation, the Montana Chapter of the Sierra Club, UM Climate Action Now, and the No Shipments Network will be hosting A Walk Through the Tar Sands. If you are not aware of this event, please click on the link or see the below post for more information. Rally at the Montana Department of Transportation offices to pressure the MDT and Director Jim Lynch to GET OUT OF BED WITH EXXON, conduct a full-scale Environmental Impact Statement, and deny the permits for the tar sands corridor! Where: Montana Department of Transportation offices, 2100 W. Broadway. Please join us Thursday to highlight the fact that Jim Lynch and the MDT, in refusing to acknowledge the overwhelming community opposition to this project and by fast-tracking the environmental review process, are catering to big business at the expense of the very public interest which they are obliged to serve.